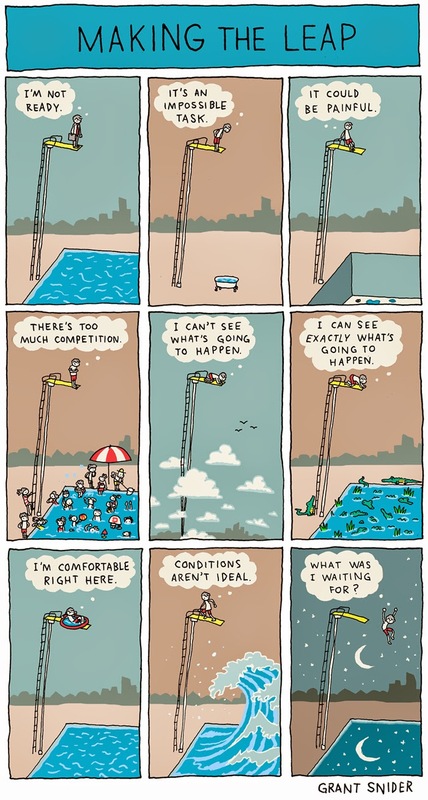 Comic illustration by Grant Snider, Incidental Comics. Published with permission; all rights reserved. I write a lot. I'm still trying to master the art of lean writing and I've often found it beyond my grasp. Through nine panels and nine thought bubbles, Grant Snider of Incidental Comics precisely explains a concept I've been trying to put into words for ages. Conditions will never be perfect, sometimes you just have to go for it. They say a picture is worth a thousand words, maybe the hard part of this idea is that it cannot only be explained in words, it needed a combination of words and images to conjure up emotions we can all understand. It's scary before hand and we delay and delay, but if and when we do it, we often don't know why we waited.